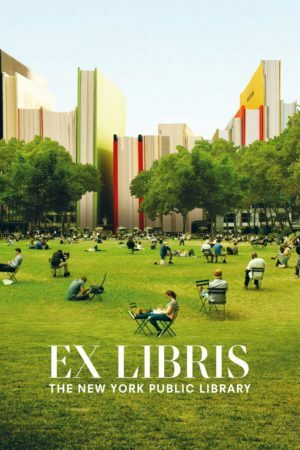 I don't quite know how the career of Frederick Wiseman works - why 2015's In Jackson Heights seemed to rate such a tiny speck of a release, and now his follow-up, Ex Libris - The New York Public Library is getting substantially more exposure. At least, more exposure by Frederick Wiseman standards, which is to say that I expect 96% of the people reading this paragraph had never heard of the film three minutes ago. The usual scene-setting that always seems to start every Wiseman review now follows: over a career now celebrating its 50th anniversary, the 87-year-old Wiseman has specialised in making portraits of institutions. Not quite all of his 46 features, but definitely an overwhelming majority, find him setting his cameras up unobtrusively in the corners of rooms as people responsible for the operations of a particular organisation go about the business of operating it, and the film's titles tend to have the austere simplicity of somebody jotting a description down on a file folder: Hospital, Central Park, State Legislature, National Gallery. Other than the poetic flourish of its title, Ex Libris - The New York Public Library does much the same thing. The subject this time is, indeed, the New York Public Library system, the fourth-largest in the world, serving Manhattan, the Bronx, and Staten Island. And certainly, one of the primary focuses is on the work of operating the library, both on the grand scale of the board of directors trying to manage dozens of branches serving millions of people across three boroughs, and on the more focused scale of the branches themselves, each with different communities that need to be helped out in different ways. But it's not the only thing Wiseman is interested in, this time around. Indeed, to describe Ex Libris as "a film about how libraries are run" isn't just misleading, but partially wrong. It's also, perhaps primarily, about how the library intersects with the society around it, and so instead of lengthy scenes of the physical conduct of the library is achieved (though there is one scene wordlessly following the process by which inter-branch loans are sorted, and I'm not sorry to say that A) it's my favorite thing in the movie, and B) I wish there was more of this kind of thing), we get lengthy scenes of the library's outreach. No accident that the first scene in the film is one of its several public talks given by a famous person - atheist activist Richard Dawkins is up first, and we also see Elvis Costello, Patti Smith, and Ta-Nehisi Coates before the film ends, more than three hours later - hosted in the system's flagship branch in midtown Manhattan. The film's central thesis, much like the thesis of the people responsible for keeping the NYPL an active, thriving part of New York's cultural life, is that a library is more than just a repository of books, or even a repository of knowledge. The idea, instead, is that the library is more like a conduit for knowledge, doing whatever is required to connect people with the world around them. And if, in the 21st Century, that involves a substantial downgrade in the romantic idea of stacks and stacks of books lined up by the thousands in neat rows, gently giving off the autumnal aroma of musty pages till the whole space feels like a sea of papery musk... well, so much for romance. Wiseman's portrait of the NYPL is digital and activist. The film has no narrative arc to speak of (the director/editor inserts shots of flyers, posters, and other ephemera with dates on them to help situate us chronologically in the fall of 2015, but there's little other sense of time passing), but it does have one fairly well-defined causal chain, in which early conversations about how the NYPL can help individuals without internet access at home get it leads to a quietly triumphant, downright thrilling moment in which wireless hotspots are handed out. That's the kind of thing Ex Libris cares about: how, in a changing world being overwhelmed by digital knowledge, can a traditional institution, born of and sustained on private wealth, occupying physical spaces creaking with historical weight, meet the needs of people very different from the ones it was originally designed to serve? And once that notion gets read into the film, it's not such a long jump for it to slowly transition over its running time into working as a sideways examination of race in New York (in this respect, an overt stand-in for the United States), with more and more of the overheard conversations along the way just so happening to center on questions of how imbalances in knowledge access, technological access, and basically every other kind of access you could have to something disproportionately harm African-Americans. In this way, Ex Libris is a little bit of a mix of Wiseman's last two films. From National Gallery, it takes up the question of how old institutions can remain relevant in new contexts; from In Jackson Heights, it examines how urban multiculturalism works, or how indeed it doesn't work in creating a just society. It's a natural, comfortable fit, and it works well enough to make Ex Libris work as a secret social commentary, which is good: honestly, it's not nearly as good as a fly-on-the-wall examination of the NYPL. Which is a shame, given that this kind of "take it all in" ethos has worked out so very well for Wiseman so many times, but I think that what has happened is that the ruthlessly objective Wiseman has fallen in love with his subject matter. Ex Libris well and truly believes in the mission of the New York Public Library, and much of what happens in the film begins to take on a star-struck quality: can you believe that Elvis Costello is just there, and you can see him talk for free? Thanks NYPL! Isn't that image archive amazing? And how wonderful it is that there are jobs programs offered by local branches? NYPL, you're the best! Far be it from me to tell an 87-year-old that he needs to quit his enthusiasm, especially because it's infectious, but I do think that slightly more critical distance would help things: National Gallery was an admiring portrait as well, without ever once feeling like it was fawning. Ex Libris is a long sit at 197 minutes, and I cannot claim with any honesty that every one of those minutes is equally elucidating. There's a lot of redundancy, down to the matter of establishing shots (Wiseman uses street signs to make sure we know which intersection each of the dozen-odd branches the film peeks into can be found at before we go inside of it, which is adorable; he also has a habit of showing us those street signs whenever we go back, which is considerably less adorable). There's also considerably more visible editing than in any other Wiseman film I've seen, which means that this redundancy doesn't feel like the inherent, natural effect of life going about its ordinary rhythms (which is what we get in e.g. the ballet documentary La Danse: Le Ballet de l'Opéra de Paris); it feels like something that has been designed and intentionally placed in the movie's path. And that's not a great feeling, by any means. God knows, this doesn't invalidate Ex Libris as a movie or as a portrait. It's less exhaustively satisfying than the best of Wiseman, and its open cheerleading makes it feel less comprehensive than one might hope from a movie of such generous length, but the simple reality is that this kind of deep-and-wide documentary exploration of a narrow slice of humanity is so intrinsically great that even a "disappointing" Wiseman film still almost automatically gets a slot among the year's best nonfiction films. I'd not want this to be someone's first exposure to this filmmaker's process, but quibbles aside, it's a thoughtful, probing piece of cinema, and those are never unwelcome.